Anyone who knows me knows that I love Mustangs… always have always will. My dad used to take me to see them come off the factory line where he worked in Dearborn, Michigan. We would sit at a Duncan Donut Shop and look out the window at a dealership that had all the Mustangs lined up. Even as a child.. I knew I would have one some day. And I’ve owned several. It was past time to sell my current ‘stang. It took a Mustang to get me out of my Mustang, and more importantly it took the Lord to show me it was time. Tuesday of this week, I had a rare day off in the middle of a work week. Monday night I spent time looking on the internet pricing Mustangs to figure out exactly what I was interested in. I gathered my printouts with dealer incentives and Kelley Blue Book prices so I was educated as to what my 2005 Mustang was worth. My plan for the day was to go to Rock Hill first to get my car detailed just in case I traded it in. Next stop, a dealership in Rock Hill, and then work my way back towards Fort Mill Ford, and then check out the Charlotte dealerships. I was greeted by a nice salesperson and I told her about my plan for the day. There was one item I had to have on my Mustang, that was leather seats. My 2005 Mustang had cloth seats that I had to replace with leather because the cloth ones wore out. I kept looking inside the vehicles and not one of them had leather. That really was a deal breaker for me. She told me I could have leather put in for an additional charge. The other thing I wanted was a premium package which was the middle-of-the-road Mustang which had upgraded rims and trim and technology packages. I was honest with my salesperson and told her I wanted to go to Rock Hill and that I would work my way back and that she didn’t have any cars I wanted anyway. We go to My salesperson’s office just to see what the price of the base Mustang is.. and I figure I can trick it out with leather seats and better rims later. This way my payment would be low. So when I’m in the office with the salesperson.. I feel prompted to show her some tricks on her ipad. So I give her all my quick tricks on the iPad– some ways to make it quicker, ways to organize photos and she really enjoys the lesson and wants more classes! As I listen to her pour out her heart about her mother who is choosing not to take any chemo or radiation treatments, I know I have to tell her that the Lord healed my father and healed me and if He will do it for us, he will do it for her mom. I told her It doesn’t matter her age. We spoke about faith. We spoke against doubt and unbelief. We talked about how Jesus healed all! Praying for somebody in public is a little different at a dealership with sales people in glass offices, but this was life or death. We didn’t care. We just went for it! I told her to read healing scriptures in the Bible to her mother everyday. But he was wounded for our transgressions, he was bruised for our iniquities:the chastisement of our peace was upon him; and with his stripes we are healed. She was touched. I was touched. And like I stated before, the Mustang didn’t matter at this point. We started to look at the numbers. I thought…. “maybe Lord, you brought me here for her and to build her faith and maybe I’ll just get the base Mustang even though that is not the desire of my heart.” I would just deal with it and upgrade the things that I wanted to upgrade later. 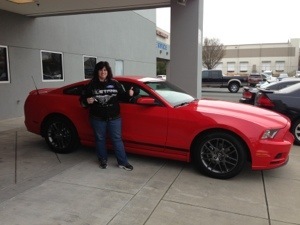 It would’ve been a little bit difficult to go from a 2005 Mustang totally loaded with navigation and leather seats and sported out like a GT and bigger rims to a plain Jane maroon-colored Mustang, but at that point I was fine with it. Because my dad worked at Ford over 35 years, I get a discount. So she looked up my discounted price on the base Mustang. 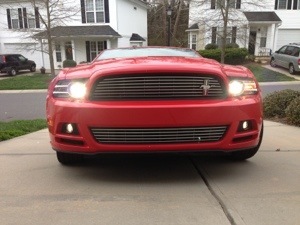 My dad’s discount was basically the same price that Fort Mill Ford was asking for the base Mustang. She then tells me that they have a sister dealership on the other side of town and that I could pick a car online and they could bring it to me. Immediately we see the 2013 red Mustang, black leather seats, updated rims, updated technology package integrated Bluetooth with $5000 worth of discounts from the dealership. 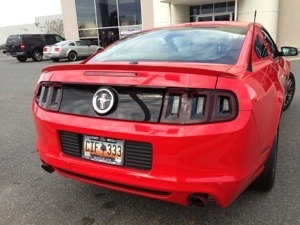 Couple that with my dad’s discount we did the numbers and the base Mustang was the same price as this TRICKED OUT PONY! He gave me the tricked out Pony at the price of the base Mustang! WHAT! YOU BETTER PRAISE HIM! I was ready to settle for a base Mustang, any color, and the Lord remembered my prayers more than I did and he cared about the desires of my heart. We’ve got to put Him first. We have got to have compassion for other people. We have got to stop and pray for people without even thinking about it. When you dig a little deeper, The Lord will show you what burdens people are bearing behind that smile. Here is the icing on the cake: a few years ago, I verbally committed to go back to MorningStar and made my decision to go to that prophetic church so I could learn more about prophecy. For the last few years I have been wondering if promotion and growth and transitions happen in the spiritual or natural first?